First Line:"This can't be real..."
Review:I adored K.A. Tuckers Ten Tiny Breaths series every book was pretty amazing but with this one I just couldn't love it like I wanted to. I didn't care for the past and present point of views, I felt that by revealing the past through Jesse's eyes it took away all the mystery that could have been there in the present day. The main character is Alex who after being left for dead wakes up with no memory. She renames herself Water because of a tattoo she has which somehow she knows is a symbol for water. There is the boy next door, Jesse whom she feels a connection with and even though she may not know what and why the reason behind that is we the readers get to learn about all of it very early on due to Jesse's point of view which honestly sucked. I would have preferred to be left in suspense until the very end and learn everything along with Alex instead with the past point of view there was no surprise element which prevented me from loving Burying Water. Another issue I had was the romance. I didn't feel any chemistry between Jesse or Alex. I'm still trying to figure out how they went from being attracted to each other to being in love. Also the ending I feel it was wrapped up to quickly and one major thing happened to one of the characters that was just too convenient. I did like reading in Water's present point of view seeing how she was coping with everything. I loved Ginny the old lady who has some serious issues of her own but was kind enough to take Water in. 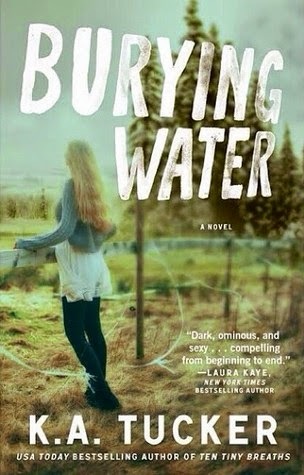 Overall Tuckers writing as always was flawless but Burying Water failed to captivate me. ~"He fucked up. This is on him. He was given an angel and he tried to break her wings." ~"He said the truth is like that water: it doesn't matter how hard you try to bury it; it'll always find some way back to the surface."